Hoarding cleanup in Dallas is a necessity which is not limited to this city alone. It is estimated that about 3 millions hoarders can be found within the United States alone, and quite a number of them are in Dallas. Hoarding or Obsessive Compulsive Disorder is a medical condition that causes the sufferer to collect different household items or things that they thought they would need, but which they will never need eventually. The problem with this condition is that sufferers get addicted to it, and they keep collecting all kinds of trash, papers, pets, human and animal wastes, and all kind of things one can think of, they will collect these things up to the point of filling doorways and passages in their homes with them. Some sufferers have filled their garages, offices, and homes with theses items to the point that they became overwhelmed when it comes to removing them, and instead of getting relief, the situation keeps getting worse, opening the door for all kinds of rodents and infestations, which is dangerous to the health of the sufferers as well as others living around them. 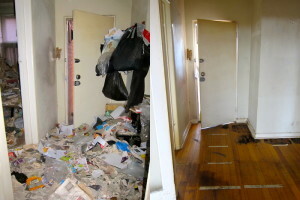 When it comes to a Dallas hoarding cleaning situation, our experience and knowledge of the hoarder cleanup job, coupled with our always ready and highly qualified personnel have made us amongst the most sought after Dallas hoarding cleanup teams around.